Finally the news we were waiting for, for so long, has arrived. It was only a matter of time. NASA’s Kepler Telescope, has discovered the first Earth-sized extrasolar planet, orbiting in the habitable zone, a region around a star where water in the liquid state can be found. The Earth’s “cousin” planet is called Kepler-186f, it is about 500 light years from the Earth, in the constellation of Cygnus. It has been called Kepler-186f because it was discovered with the Kepler telescope, rotating around the star Kepler-186 and is part of a system of five planets (Kepler-186b, Kepler-186c, Kepler-186d, Kepler-186e and Kepler-186f). 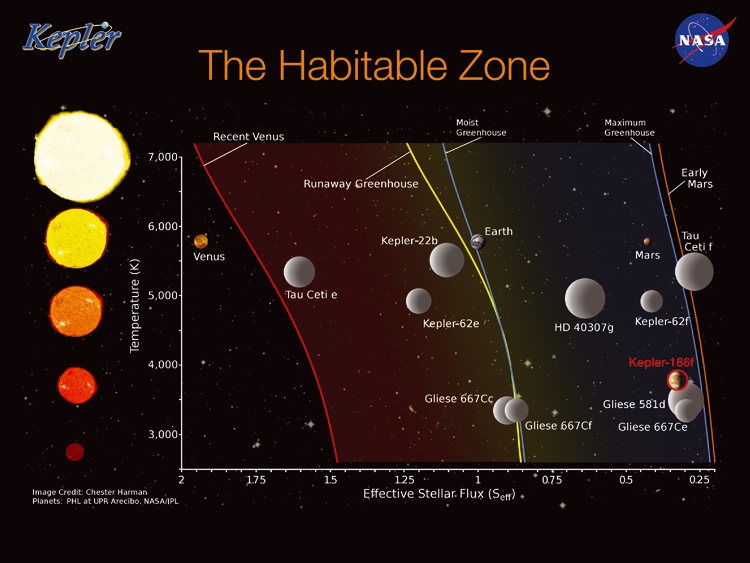 The Kepler satellite had already discovered various planets orbiting in the habitable zone, however they were all larger, at least 40% larger than the Earth. The planet system of Kepler-186 instead, consists of five planets; four inner planets, smaller than half our planet, and Kepler-186f, approximately 40% larger than the Earth. “The discovery of Kepler-186f is a significant step toward finding worlds like our planet Earth” Paul Hertz, director of the NASA Astrophysics Division, has said Kepler-186f orbits its star once every 130 days and receives one-third the energy from its star that the Earth gets from the Sun, placing it nearer the outer edge of the habitable zone. By analysing the collected data, we know that the planet’s radius is about 1.1 times that of the Earth and currently its mass is being determined. This datum is essential in order to evaluate the density of the planet and therefore understand if it is rocky or gaseous. More precisely, a distinction is made in the composition of the planets. Rocky planets are solid and therefore have a well-defined surface. They have a greater density and a smaller size than the gaseous planets. The latter are much larger than the rocky planets (to create the equivalent of Jupiter, imagine you have to align 11 Earths on its diameter), they are made of a small solid central core, covered with a very thick liquid layer, which in turn is surrounded by a gas cover. This is why they are defined gaseous planets. Due to their size they are also defined giant planets. Gaseous planets have many moons, Jupiter has more than 60. The most famous are the 4 discovered by Galileo in 1609, also known as the Galilean satellites (Io, Europa, Ganymede and Callisto). Furthermore they have a more or less evident system of rings, the most famous and extensive are Saturn’s rings. Some studies have pointed out that there is a transition threshold, a kind of limit, equal to approximately 1.5 times the Earth’s radius, beyond which the planet becomes so massive that it accumulates a dense atmosphere, consisting of hydrogen and helium, and therefore becomes similar to the gaseous planets of the Solar System. Considering the size of Kepler-186f, it is quite probable that the planet is a rocky one. To discover a planet like Kepler-186f is a difficult task. There is no telescope that can observe it directly, its light is so weak it is lost in that of the principal star. In order to reveal it, three telescopes were used. 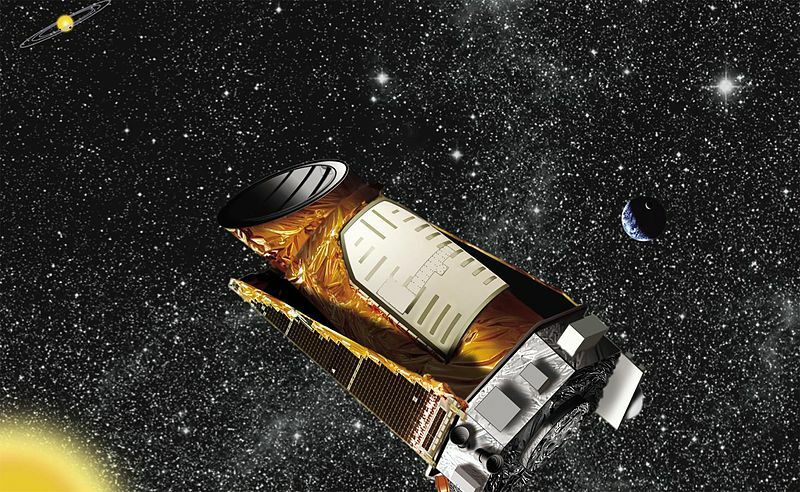 One in space, the Kepler telescope that exploits the transit method, i.e. it observes the periodic decreases in the luminosity of the star caused by the transit of a candidate planet orbiting around it (for a more detailed explanation of the observation methods, see the Special Report “Exobiology”). 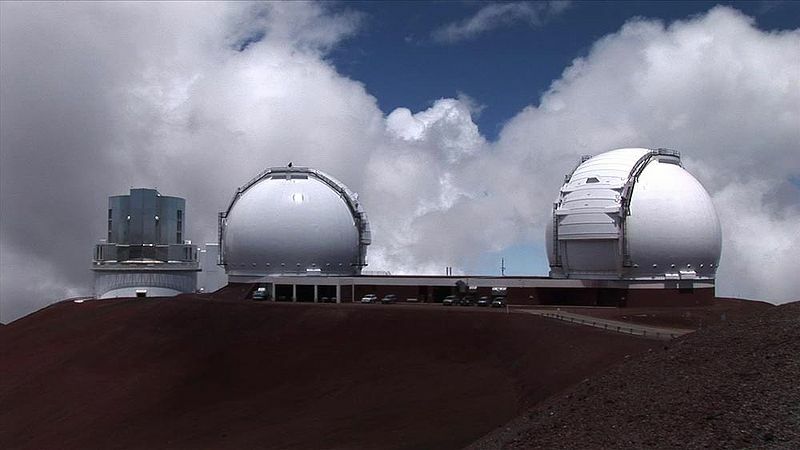 Furthermore, two of the largest telescopes of our planet were used – the twin Keck I and Keck II telescopes, positioned on top of Mauna Kea in Hawaii. The first, called Gemini North, is a 8 metre-diameter reflector telescope , while the second, Keck II is a 10 metre reflector telescope. These instruments can reach very high angular resolutions. More in particular, by exploiting the speckle interferometry technique of Keck I and the high quality of the adaptive optics of Keck II, astronomers have been able to confirm, with 99.98% confidence, that Kepler-186f is really a planet. In short, like in a police investigation, the Kepler telescope provided the first clues, while the twin Keck telescopes made it possible to close the case and find the assassin. 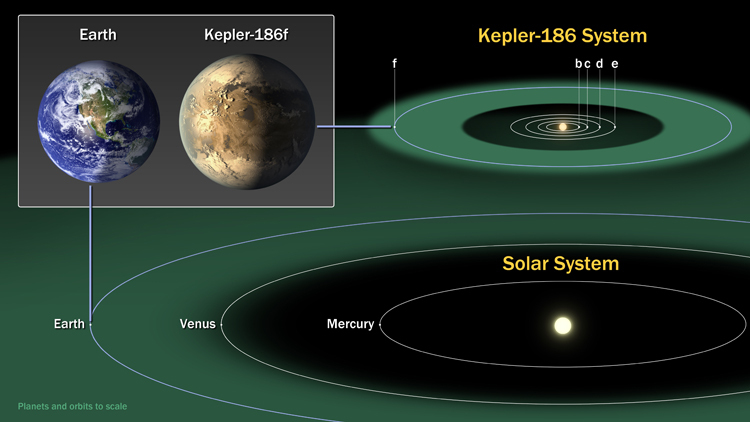 Kepler186f appears to be very similar to the Earth, however there are some differences. It rotates around a star that is very different from the Sun, Kepler-186, classified as a type M dwarf-star or red dwarf . If we observe the H-R diagram, in which each star is identified by a point corresponding to two coordinates: on the x-axis is the spectral classification (i.e. the surface temperature of the star) and on the y-axis is the absolute luminosity or magnitude, knowing the luminosity of Kepler-186, it can be stated that it is smaller and colder than the Sun. These red dwarf stars live much longer than the large stars and therefore are the best candidates for planetary systems in which life could be present. In fact, for biological evolution and for biochemical reactions to take place, very long periods of time are required, longer than the average age of the large stars. Furthermore, M dwarfs are very numerous, in fact they account for approximately 70 per cent of the stars in the Milky Way. 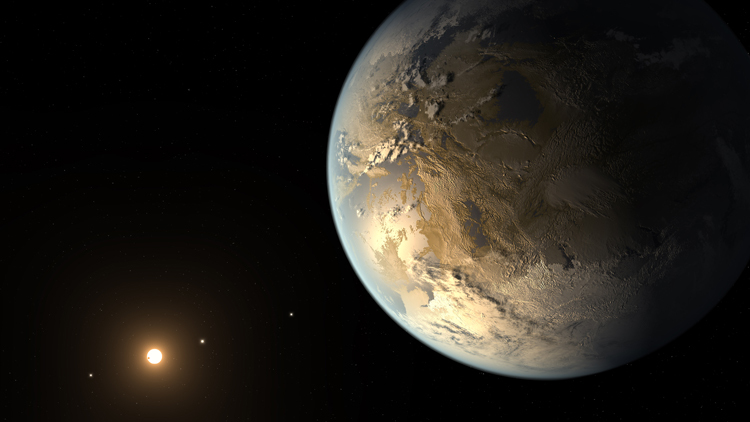 The question we would like to ask is: “Does life exist on Kepler-186f?”. Obviously it is too early to give an answer, and its position in the habitable zone does not guarantee that the planet is habitable. For example even Mars, in our Solar System, is in the habitable zone, but we know that the Red Planet has no life on it. This is because, as Thomas Barclay, researcher at the Bay Area Environmental Research Institute stated, “Being in the habitable zone does not mean we know this planet is habitable. The temperature on the planet is strongly dependent on what kind of atmosphere the planet has”. The future challenge will be to search for planets, similar to the Earth in size, composition of the surface and atmosphere, which are orbiting around stars like the Sun, where to look for life. Obviously we will not be able to send probes to study these planets because a journey with our present technologies, would require too much time. We can however analyse the chemical composition of the atmosphere from a distance. In fact living beings, even if they are small, modify the environment and what is being looked for are distinctive signs that can be traced easily from a distance. One day, many years from now, will some human being set foot on these exoplanets that are similar to the Earth? To date, the answer is no, the journey would take too long. If we travelled at the speed of light, to reach Kepler-186f, it would take us 500 years. At present the human space colonization programme is still limited to the Solar System with the European Space Agency’s (ESA) Aurora programme. The Aurora programme will carry out a robotic exploration of Mars, the Moon and other asteroids using automatic probes, and subsequently a human colonization of the Red Planet. Currently the first step in the time-schedule is the mission to the Red Planet in 2016 called ExoMars, with the Mars Trace Gas Mission probe and the rover EDL which will land on Martian soil. In 2018, two rovers will be sent, one American and one European, with the aim of exploring Martian soil on site. In particular, studies will be conducted on the gases that are present in the atmosphere. By 2020, the Mars Sample Return Mission will begin, which will collect and subsequently forward samples of rock from Mars to the Earth. Similarly, always by 2020, a number of tests and simulations will begin on Earth, which will involve human crews, which will test and consolidate the new technologies to be used in the future missions. The first human mission to Mars is foreseen in 2030. Astrophysicist and science populariser, Ms Romaniello is responsible for training and development and the installation of museum exhibits for the Turin Planetarium.